"It is the custom for the gentlemen to go to market at Cincinnati; the smartest men in the place, and those of the “highest standing," do not scruple to leave their beds with the sun six days in the week, and, prepared with a mighty basket, to sally forth in search of meat, butter, eggs, and vegetables. I have continually seen them returning, with their weighty basket on one arm and an enormous ham depending [sic] from the other. We reached Cincinnati on the 10th of February . It is finely situated on the south side of a hill that rises gently from the water's edge…its landing-place is noble, extending for more than a quarter of a mile; it is well paved, and surrounded by neat, though not handsome buildings. I have seen fifteen steamboats lying there at once, and still half the wharf was unoccupied. We were soon settled in our new dwelling, which looked neat and comfortable enough, but we speedily found that it was devoid of nearly all the accommodations that Europeans conceive necessary to decency and comfort. No pump, no cistern, no drain of any kind, no dustman's cart, or any other visible means of getting rid of the rubbish, which vanishes with such celerity in London, that one has no time to think of its existence ; but which accumulated so rapidly at Cincinnati, that I sent for my landlord to know in what manner refuse of all kinds was to be disposed of. "Your help will just have to fix them all into the middle of the street, but you must mind, old woman, that it is the middle. I expect you don't know as we have got a law what forbids throwing such things at the sides of the streets ; they must just all be cast right into the middle, and the pigs soon takes them off." In truth, the pigs are constantly seen doing Herculean service in this way through every quarter of the city ; and though it is not very agreeable to live surrounded by herds of these unsavoury animals, it is well they are so numerous, and so active in their capacity of scavengers, for without them the streets would soon be choked up with all sorts of substances in every stage of decomposition. 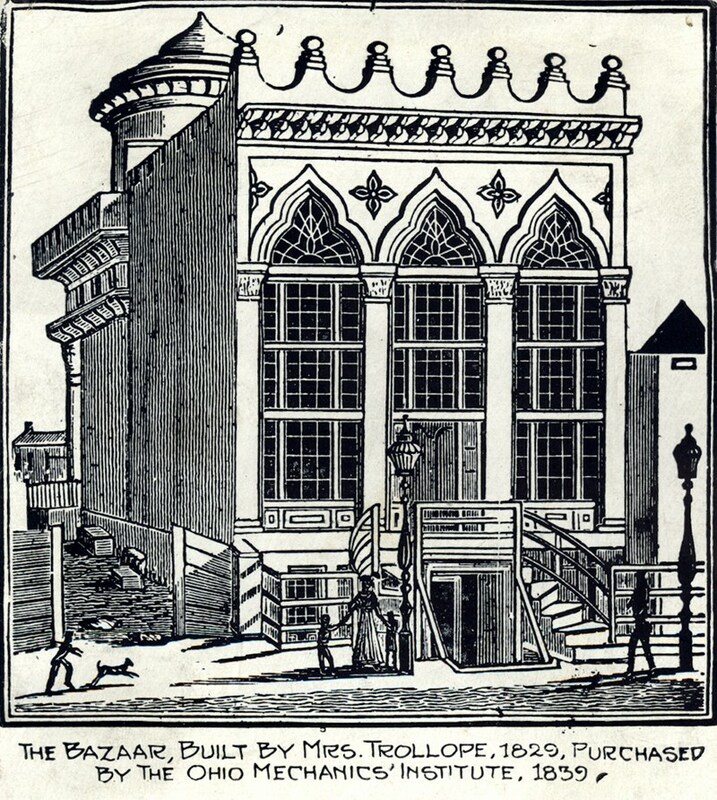 Trollope's building Bazaar, sold for $10,000 for the Ohio Mechanics’ Institute who held its annual exhibition in 1838. "The hall of the institute is situated on Third street, east of Broadway; it is thirty-seven feet front by one hundred feet in depth. 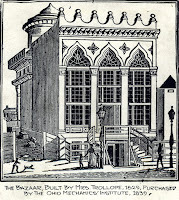 The basement contains apartments for the janitor and curator, with two class-rooms; the first floor contains the lecture-room, apparatus-room, library, directors’-room, and a room devoted to the use of the Western Academy of Natural Sciences; the second floor contains the reading room and a large saloon, which was formerly a ball room. There is a rotunda over the portico in the rear, which was originally intended for the exhibition of paintings, but which is now occupied by the drawing class. At the annual fairs, the first and second floors are devoted exclusively to the purposes of the exhibition, as well as a vacant lot adjoining." Cist, Charles. Cincinnati in 1841: Its Early Annals and Future Prospects. 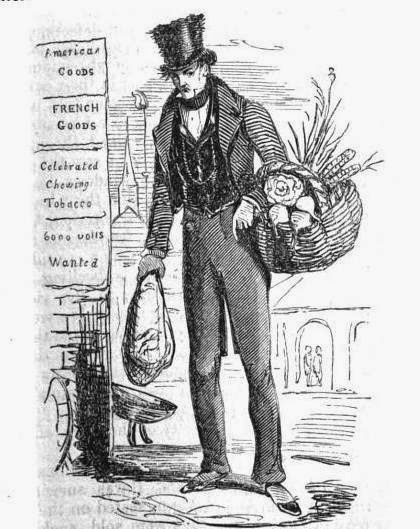 Images: Man shopping from Trollope's book; Bazaar from University of Cincinnati library blog. If the image is any indication, the men really dressed up to do their shopping, too. I was reading about the pigs in New York city (and New Amsterdam before). There is a myth that Wall Street was named after a wall built to cordon off the pigs, at some point, but this appears to be a myth. Maybe you're other article goes into this. I'll check it out!